During my student teaching placements I have asked students to voluntarily complete anonymous assessments of my teaching while I have stepped out of the room. Students were told that their responses would not only assist me in my development as a teacher but could also be used in my portfolio or during a future interview. "She made History my favourite class when it was my least favourite. I remember mostly everything and she makes it all really interesting!" 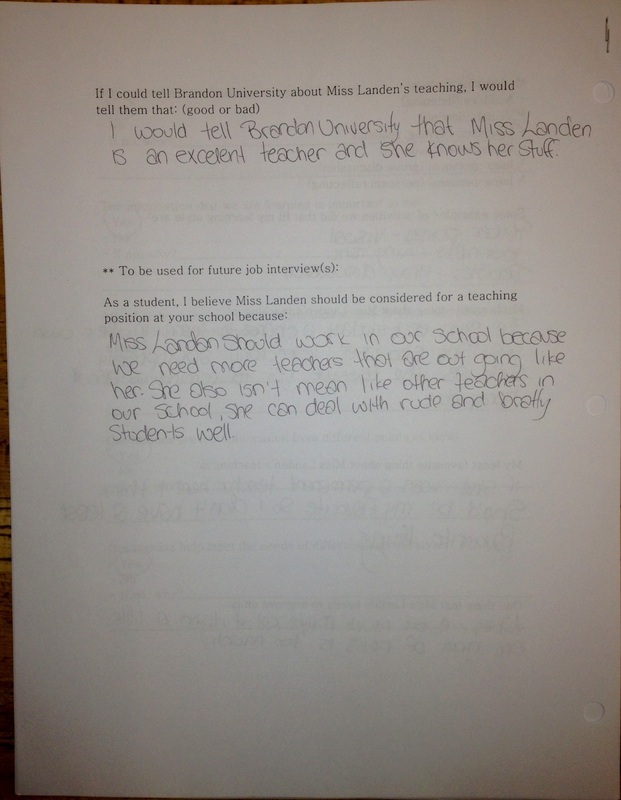 "Miss Landan should work in our school because we need more teachers that are out going like her. She also isn't mean like other teachers in our school." "How involved she is with the students. How well she explained topics. How accurate her points and knowledge were. She was always in control of the class." 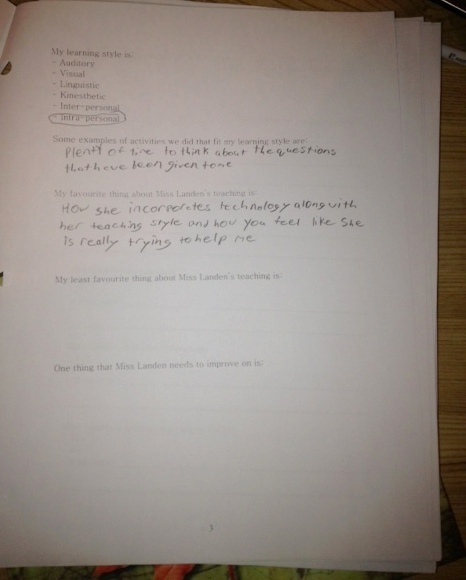 "How she incorporates technology along with her teaching style and how you feel like she is really trying to help me." 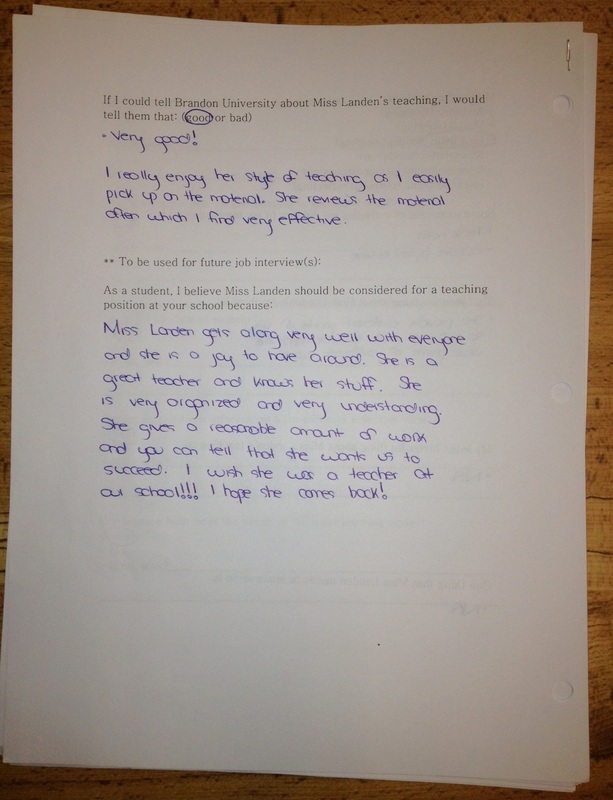 "Miss Landen gets along very well with everyone and she is a joy to have around. She is a great teacher and knows her stuff. She is very organized and very understanding. She gives a reasonable amount work and you can tell that she wants us to succeed. I wish she was a teacher at our school!!! I hope she comes back!" "She is a really great teacher. Even though she is young, which can sometimes be a down point (not in her case), she associated well with us and makes everything fun and easy to learn. I will really miss her." "She doesn't make it boring... She shows everything from different points of view. She also makes her lesson and assignments to help us learn in a way that everyone can understand. 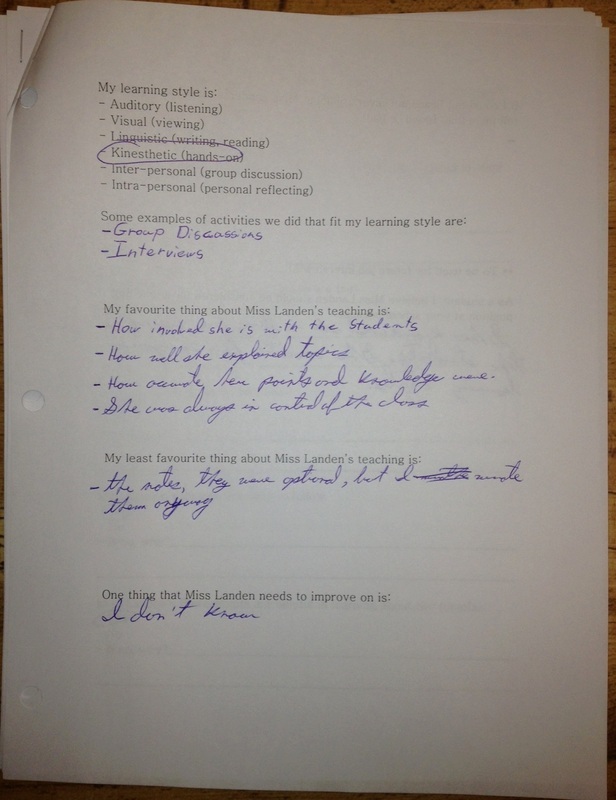 Lastly, she makes her lessons so that they accommodates everyone's learning styles."